I am publishing this blog with mixed feelings: In 1979 the Sandinista-led revolution ousted one of the most brutal dictators in Latin-America. As a couple of thousand others I went to Nicaragua in order to support the Sandinistas and arrived about a week after the revolution. At the time of travelling another time through Nicaragua (May 2018) and putting together this blog the Sandinista-led government is facing social unrest following its decision to cut social spending. In order to put down the riots police in April/May 2018 used excessive force against unarmed protesters killing up to 90 protesters and wounding many more. I am deeply shocked and dismayed by these gross human rights violations. In the 1970s most of the countries in Latin-American were governed by authoritarian regimes or military dictatorships. One of the worst countries was Nicaragua ruled as a family fiefdom by dictator Somoza who many years enjoyed strong US support. In the late 70s the guerrilla movement Frente Sandinista de Liberacion Nacional (FSLN, “Sandinistas”) gained support among the Nicaraguan population and on 19th July 1979 was able to overthrow dictator Somoza and his National Guard (“Sandinista Revolution”). Arriving after the revolution had already succeeded and having a camera with me I started working as a free-lance journalist taking pictures and writing for Austrian Newspapers. As there were no digital cameras at that time I took photos in black and white as well as in color. 39 years later I had them digitalized in order to publish them in this blog. Caveat: Pictures showing events prior to the revolution are copied from local newspapers in 1979. After soldiers of the National Guard in front of a TV camera had shot an American journalist public opinion in the USA turned against Somoza and his regime collapsed in mid-July 1979. The Frente Sandinista de Liberacion Nacional (FSLN), a left-wing guerilla movement, started the armed struggle against the Somoza regime in 1977. It called itself after Augusto César Sandino a legendary leader of the resistance against US troops present in Nicaragua 1909 till 1933. It combined a broad spectrum of political tendencies including Marxists and supporters of the theology of liberation. From communist movements it distinguished itself by its commitment to democracy, political pluralism and mixed-economy. The following pictures show some of the FSLN comandantes Tomás Borge, Edén Pastora (who later switched sides), Daniel Ortega, and members of the Sandinista guerilla. Parallel to the guerilla the Sandinistas had established a grassroot movement to support the resistance. Photos show meetings and manifestations in summer 1979. In August 1979 the Socialist International, the world association of social-democratic parties, which had sympathized with the liberation struggle in Nicaragua sent a fact-finding delegation to Nicaragua led by former Portuguese prime minister Mário Soares. Holding a support letter of the Austrian Social Democratic Party I simply was integrated into the delegation as an Austrian member. Minister of Interior Tomás Borge led the delegation to a prison in Nicaragua where imprisoned members of the Guardia Nacional were detained. The new government arranged for the SI-delegation a visit to Masaya and the fortress Coyotepe which under Somoza was used to imprision up to 800 political prisoners. Among those who returned to Nicaragua to support the revolution was also Ms. Bianca Jagger (ex-wife of Mick Jagger, Rolling Stones). She originated from Nicaragua and granted me an interview. Ms. Jagger, who later became a well-known human rights activist, in May 2018 returned to Nicaragua publicly denouncing the recent police brutality. Managua, the capital of Nicaragua, in 1972 was severely hit by a 6.2 earthquake which destroyed 90 % of the buildings in the center of the town and killed approximately 5.000 persons. Photos show the few remaining buildings as the center had not been rebuilt. There were a number of poor neighborhoods in Managua where people lived a miserable live. In order to invalidate the large amount of money which the Somoza supporters had brought out of the country the new government in September 1979 introduced a new currency and the population was forced to exchange the old against the new currency. The fact that each person could only exchange a certain amount while the remainder got frozen for a certain period of time created considerable resistance among the population. Photos show people queuing up and protesting in front of the banks. Some weeks after the revolution the FSLN arranged a parade to present the weapons which they had captured during the war. Photos taken during the rehearsal the day before the actual parade. Some photo showing how I looked like in 1979 in Nicaragua. In 1986 I returned another time to Nicaragua: A lot had changed in between and the Sandinista-led government was under sever pressure: Against the background of the intensified cold war US President Ronald Regan p utincreased pressure on the new government in Nicaragua. This included an economic embargo, mining the sea in front of Nicaragua’s harbors and financing a guerilla force called “Contra” with the goal to overthrow the Sandinista-government. Nicaragua on the other hand received support, military hardware and training from the Soviet Union and Cuba. Photos show captured Contra-fighters presented in a press conference. The center-right and conservative parties had left the government and now stood in opposition to the government dominated by the Sandinistas. Photos show press conferences and rallies of the opposition. In particular Nicaragua’s economy and infrastructure suffered and in front of supermarkets people had to queue up for hours. The government reacted by providing food packages. The articles displayed in the second picture were meant to last for one month. Public transport was inadequate and people were fighting to get on a bus. On the other hand, the new government could point out tangible achievements: In particular the rural population had benefited from a country-wide alphabetization campaign, a land reform (where estates of Somoza supporters were distributed) and improved access to health care. The following pictures show President Daniel Ortega and political and military leaders at a manifestation in support of the new constitution. 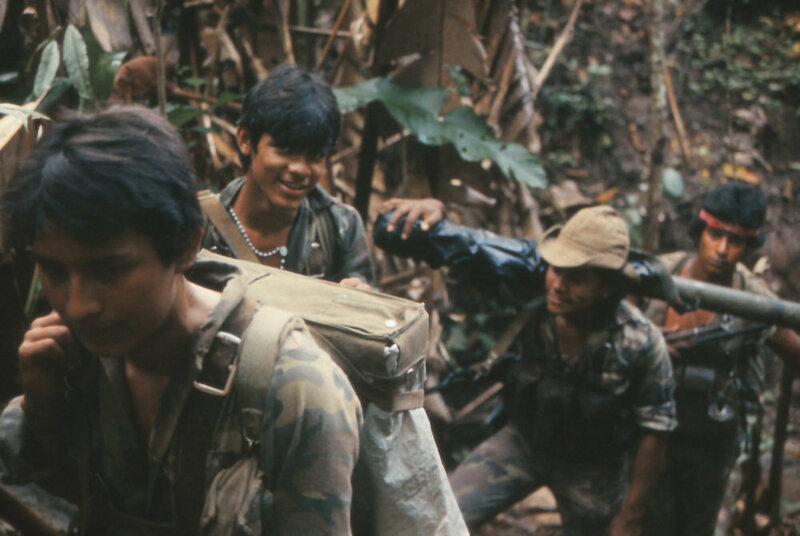 The most dangerous threat for the Sandinista government came from the “Contra”, a guerilla force trained and equipped by US covert operations. In order to fight the Contra Nicaragua’s new army created special unites (BLI = Battalion de lucha irregular) which should take up the fight in the forest. I got the permission to join such a unit as an imbedded journalist for ten days in the province of Matagalpa. After three days we were flown with Russian helicopters deeper into the jungle. In order to avoid being shot down by US-Stinger anti-aircraft missiles the helicopters flew only a few meters of altitude above the jungle. You can see me on the third picture sitting on the earth with the camera. After seven days in the forest and without any contact with the enemy were reached a small hamlet. As we were already short of food the commander bought a bull which was tied to a tree and killed with a knife. In the 80s the Austrian government and Austrian NGOs supported a number of humanitarian projects in Nicaragua. The most prominent was the Austrian hospital in Rama / La Esperanza in the east of Nicaragua. Together with a German doctor who had joined the FSLN in 1978 I conducted a small medical support project. I raised funds and bought equipment (drainages and valves) to operate children suffering from hydrocephalus. Dr. Carlos Vanzetti (this was his nom de guerre) then implanted the drainage devices. Photos show children before and after the operation.